RETURN OF THE JEZ! And this time he’s bringing the orchestra! 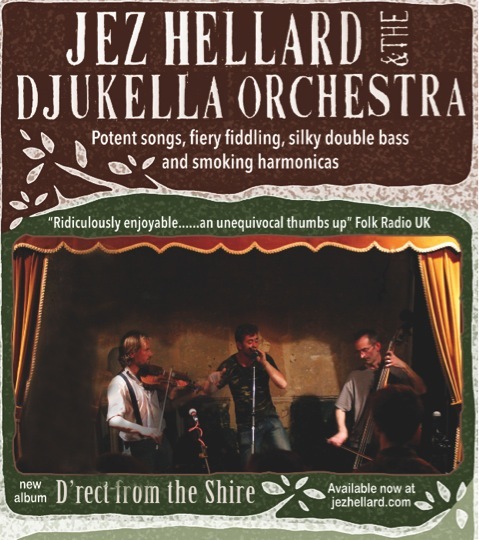 Much loved balladeer and folk warrior, Jez Hellard, returns to Letham Nights in style, this time bringing an amazing trio of troubadours, The Djukella Orchestra to entertain you and sting you into action. The band have prepared a whole set of beautiful music as he says: “specially designed to counteract the effects of Trump, Armageddon, talent shows, fracking, dolphinoplasty, Paul Nuttalls and the curse of magnetic lettering, and to encourage you to walk with a charismatic sophistication to your step”. The Djukella Orchestra includes some of the finest young instrumentalists on the UK folk scene. They will offer you an aural cornucopia of ballads, jigs, and reels as well as some rumba, tango and reggae, from their latest live release D’rect From The Shire – all designed to make you dance like a dervish. As you will remember if you were at his previous Letham Nights performances, Jez Hellard is a singer of potent songs, a virtuoso guitarist and a simply stunning, smoking harmonica player. His lyrics are often stinging political swipes at the establishment, railing at the injustices of current and past events. Add to this some silky double-bass and fiery fiddling and you have a blend of virtuoso musicianship, witty political comment and a deep repertoire of powerful songs that will leave you breathless. So, get a move on and get booked!